A new species of plant-eating dinosaur, which sports a grapefruit sized mass of bone on the top of its skull, has been uncovered in Texas’ Big Bend National Park. 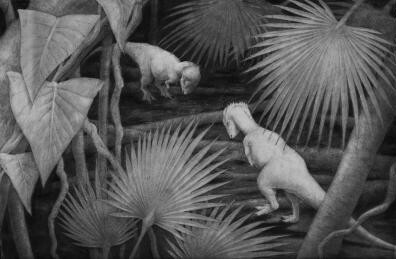 The find, which would have lived 70 to 80 million years ago, is reported in the latest issue of Cretaceous Research1. Named Texacephale langstoni2, the dog sized creature is believed to be a member of the Pachycephalosaurians, a group of thick-skulled, bipedal dinosaurs. Lead author of the paper, Yale University’s Nicholas Longrich, believes that Texacephales most likely used their reinforced skull to ram other one another. Scientists speculate that Texacephale langstoni used the lumps of bone on top of their skulls to ram one another head-on. Image credit - Nicholas Longrich/Yale University. This new find helps to support the notion that dinosaurs found in the northern parts of the United States and Canada are quite different from their southern compatriots. “Instead of roaming across the North American continent, we see pockets of different dinosaurs that are pretty isolated from one another… Every time we get good fossils from Texas, they end up looking very different from those to the north,” said Longrich. Discoveries around Big Bend tend to be few and far between, leading Longrich to believe that we might not have a complete concept of past diversity: “I think we underestimate how many different species there were,” he said.